There’s a certain sound that all cat owners dread. You know the one we’re talking about. It’s the repeated gulping sound that indicates you’re about to have a cat throwing up. None of us welcome hearing it, and none of us like to deal with the consequences afterward. All of us are familiar with the thought process that follows. We hope it was on a dry floor rather than the bedsheets. We hope it was mostly solid. We hope it was an isolated incident, and that more aren’t following. When we’ve taken the time to forgive our cat for the thoughtlessness of throwing up indoors, though, we move on to hoping they’re OK. When you find yourself on your hands and knees with a tissue cleaning up cat sick, take a moment to be glad of the way cats go about it. It’s not much fun to clean up afterwards. At least you know they’ve done it; imagine how much more annoying your cat throwing up would be if they didn’t provide you with any warning! Sometimes, if they start the ritual early enough, you can even move them outdoors before the inevitable happens! Every cat throws up occasionally. Usually, that’s just because of hairballs. If it’s happening too often, though – or if it’s happening more often than normal – something else might be at work. Depending on the severity, that ‘something else’ may or may not merit a trip to the vet. If you’re concerned about the regularity, consistency or any other of the symptoms of your cat throwing up, we’re here to walk you through the most common causes on this page. We’ll also shine a light on some potential treatments. How Much Vomit Is Too Much? As we said above, all cats vomit occasionally. 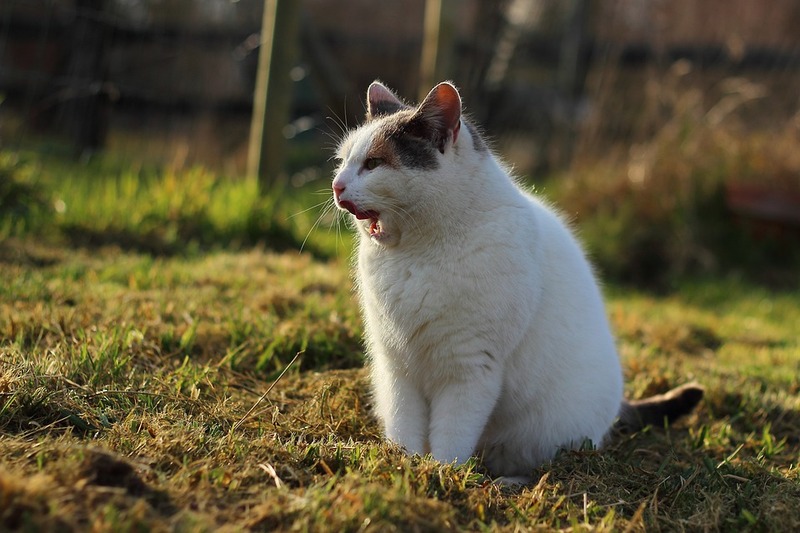 Whether it’s a hairball, some grass from the world outdoors or food disagreeing with them, it’s inevitable that they’ll cough something up every now and then. On average, a cat throws up a couple of times a month. If that sounds familiar, you probably have nothing to worry about. It’s when they’re throwing up more often than that we should worry. Even if it just appears to be a hairball every time, cats shouldn’t be rejecting hairballs on such a regular basis. That could indicate an issue with digestion, an issue with their diet, or another underlying health problem. If your cat is throwing up a couple of times a week, it’s time to look into potential causes; especially if this is a new development for them. My Cat Keeps Throwing Up: What’s Causing It? Most of the probably causes of your cat throwing up are easy to identify, and easy to solve. Most psychologists say that many of the mental health issues human adults can suffer with start in childhood. The same is true of cats If your cat was part of a large litter, it probably had to compete with siblings for food. If it left a meal along for too long, one of its brothers or sisters would step in and finish it before they got chance. In a situation, a cat learns to eat quickly to ensure that it gets a full meal. That’s great for protecting food, but it’s less good for preventing digestion issues. A cat that’s eaten too quickly can suffer from reflux, indigestion and wind in exactly the same way a human can. If you notice that your cat’s dinner vanishes in a few quick bites as soon as you put it in the bowl, and then you see your cat throwing up after eating, this is the most likely cause. Smaller portion sizes can help with this, but you may also want to consider an alternative cat feeder. A catch cat feeder could be the answer to your problems. They look a little like hairbrushes, but they’re actually very clever tools. They replicate the way your cat encounters food in the wild, and force it to slow down and work at getting a good mouthful. When you don’t have a cat vomiting food, you have a cat vomiting hairballs. There’s a reason for that, though. If you put a cat’s tongue under a microscope, it looks like Velcro. It’s rough, and it’s full of tiny little hooks which help it to grip and break food. It’s a neat evolutionary feature, and it makes mealtimes easier for your pet. Where it comes in less handy is in grooming. 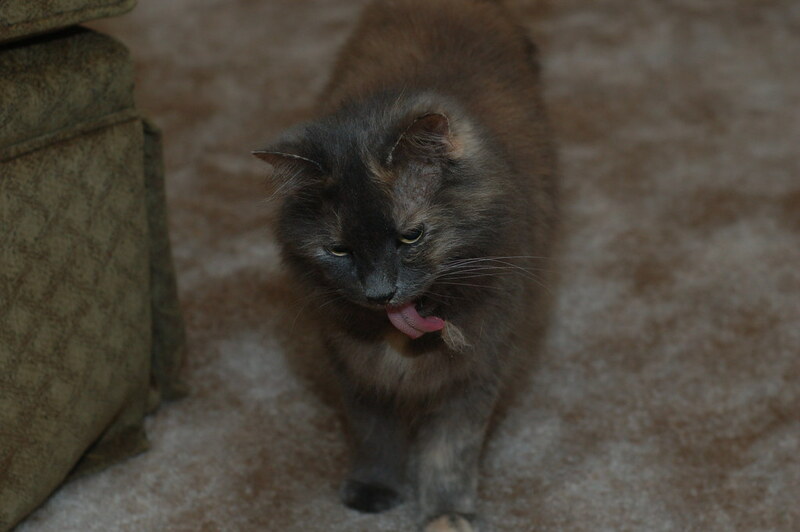 Cats, as we know, are proud and clean creatures. They like to wash often, and thoroughly. When they do so, little bits of fur get caught on these hooks. Unfortunately for cats, they can’t spit. That means the fur gets stuck there until they’re able to swallow it. That’s when the second issue happens; cats can’t digest their own fur. It builds up in their stomachs until it becomes a nuisance, and then it gets expelled as vomit. The easiest way to solve this issue is to groom your cat regularly. They do all they can on this front, but alone they can’t achieve what a good grooming session can. Plus, grooming your cat is a good way of bonding with it. Get yourself a good cat grooming accessory, and make sure you get all the excess fur off. Even cats with short hair can benefit from a little pampering session. Most cats will eat whatever you put in front of them. That doesn’t necessarily make them good at knowing what’s good for them, though. If you notice your cat throwing up after a dietary change, that’s their body telling you that they don’t agree with the changes. No matter how much your cat seems to enjoy their new food, it’s obviously not sitting well in their gut. A good diet for cats involves an optimum balance of wet cat food and dry cat food. If you’ve just changed brands, or cut out one of these food types, go back to what you were doing before. If your cat stops throwing up, you’ve both identified and solved the problem at the same time. This goes slightly hand in hand with changes in diet. Cats can have allergies just like their owners can. We sometimes make the mistake of thinking that the ingredients in cat food are all the same. They’re not, and some aren’t even close. One manufacturer’s turkey-based wet cat food is very different to another’s. It may just be that there’s an element in whatever you’re feeding them that they’re allergic to, and that’s why you now have a cat throwing up. If you find your cat vomiting more often than it used to, think again about its food intake. Have you changed brand recently, even if you haven’t changed food type? If so, reverse that and go back to what they used to tolerate. Even if you haven’t changed brands, your cat may have developed an allergy as it’s aged. Cats become lactose intolerant once they’re adult, so milk could be the issue. Many cats also have wheat allergies. Cat food for sensitive stomachs might be the answer. Sensitive stomach cat food is formulated especially to avoid allergenic issues, and could solve your cat vomiting problem. If your cat throwing up has come on suddenly, and none of the above explanations seem likely, it’s possible your cat may have been poisoned. There are many chemical and natural elements in and around a home that could poison a cat if they accidentally consume them. In these cases, it’s essential you contact a vet immediately, as the issue could be serious. Antifreeze, insect sprays used in the garden, human foods (especially leftovers which have been abandoned in kitchens) and medications intended for human use can all be toxic to cats. Always remember to dispose of your own food immediately once you’ve finished eating it if you have a cat in the house. Keep medications and dangerous chemicals in secure storage. Think very carefully about using plant or insect repellents in the garden at all; you share your living space with a cat, and its needs have to be taken into account as well. Having a beautiful garden is no use to you if your cat can’t enjoy it as much as you can! We have more in common with cats than many people suspect. There are feline versions of many standard human medical conditions. Irritable bowel syndrome is yet another one of them. The disease can impact several parts of your cat’s digestive system, including (but not limited to) the large intestine, the small intestine and the stomach. There will be a tell-tale sign if your have a cat throwing up because of feline irritable bowel syndrome, and that’s diarrhea. It’s almost unheard of for this illness to present itself without also causing your cat to start using the toilet more than it used to. Specialist cat foods are available which will cater to this need. Your furry friend will become more prone to diabetes as it gets older, just as you will. If it contracts the illness, one of the first signs will be that it starts vomiting more often. This is a symptom rather than a cause; it’s the body’s way of demonstrating that something isn’t right. Feline diabetes is a malady of the endocrine system. As well as causing a cat vomiting, you’ll also notice that it’s hungrier than it used to be and wants to drink more water, too. Although we tend to associate diabetes with weight gain, in cats its actually more likely to cause weight loss. As with several of these issues, feline diabetes can be treated with a specialist diet. You should always go to a vet if you suspect diabetes though, as they may suggest alternative or additional treatments. This is far, far more likely to occur in an older cat than a younger one. Ultimately, as we age, at least some aspect of our physiology begins to fail. For cats, that’s often the renal system. Chronic renal failure in older cats is sadly quite common. Cats rely heavily on their kidneys and put them through a lot of work during their lives, which means they’re usually first in line to give out. A cat throwing up alone isn’t an indicator of chronic renal failure; the symptoms will be far more pronounced. Your cat will also lose weight, exhibit signs of diarrhea, lose interest in food and take on more water. The symptoms can be quite similar to feline diabetes, which is why it’s so important to go to a vet if you suspect either condition is occurring within your cat. Early diagnosis is essential if chronic renal failure is going to be handled effectively. A specialist senior cat food diet is likely to be prescribed, along with other measures depending on the severity of the illness in your pet. If you have a cat throwing up, there are steps you can take at home to help. You may even be able to stop a problem before it begins! Here are some basic hints and tips, along with potential treatment information. Make sure your cat eats slowly. Like we said earlier, a catch cat feeder is the best way to slow them down if they have a habit of ‘inhaling’ their food. Don’t deviate from a diet that you know works. There’s nothing wrong with trying the latest or tastiest cat food on your cat, but just give it to them once before you bulk buy. If there are no obvious ill effects, introduce the new food slowly. Don’t suddenly withdraw their previous favorite food from them either; cats are creatures of habit, and this is likely to upset them. Groom your cat regularly. Stroke them, scratch them, and go through their fur with a brush or a comb. No matter how long or short your cat’s coat is, you’ll be helping them to shed unwanted excess fur, which will otherwise end up stuck to their tongue – and shortly after that, it will become a hairball. You already know what the next stage is! Dispose of your own food as soon as you’re done with it. Put it in a sealed bag in the bin. Don’t leave it out on a kitchen counter where your curious cat might go digging. Keep potentially harmful materials safely and securely stored. Imagine you have a young child in the house, and think about where you’d hide things to make sure they stay out of the way. Antifreeze, for example, tastes very sweet to cats. They’ll happily consume it if they can find it, and they have no idea that it’s bad for them. They’re relying on you to be their guardian! This is where the vet comes in. It’s time to speak to a vet when you’ve been through the steps and options detailed above, and nothing has changed. We’d suggest getting in touch if your cat has thrown up on three consecutive days; that’s a clear indication that something is wrong. It’s highly likely that if your cat is ill, your vet will recommend one of the specialist diets we mentioned above. Depending on the root cause, though, they may also recommend a temporary or permanent course of medication. In extreme situations, it may be necessary for your cat to undergo surgery. Some thyroid issues can only be treated surgically, as well as some issues related to chronic renal failure. Surgery will only ever be suggested if there’s a clear and obvious benefit, and a threat to your cat’s life. Thanks for stopping by to read our guide on cat vomiting. At least now you’ll feel a little better informed next time you clean up after your furry friend. We hope we’ve also given you some ways to help prevent it from becoming a regular chore in the future. Why Choose a Heated Cat Bed?